Under a mountain of unending fog and chilled by the news reports of record breaking snowfall on the East coast, I took a vacation to The Big Island (or Kona), Hawaii last week. 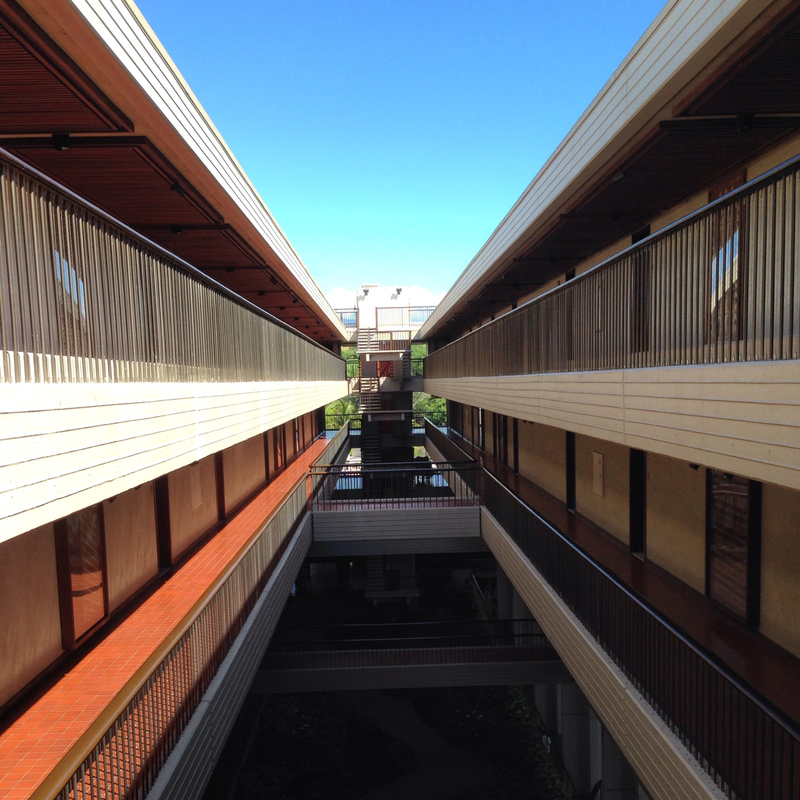 I stayed at the Mauna Kea Beach Resort, a resort hotel built by SOM in the 1960s. Did you think I was going to talk about those Mai Tais I enjoyed? This is an architecture blog, after all! The Mauna Kea is very much tied to its decade without looking dated. 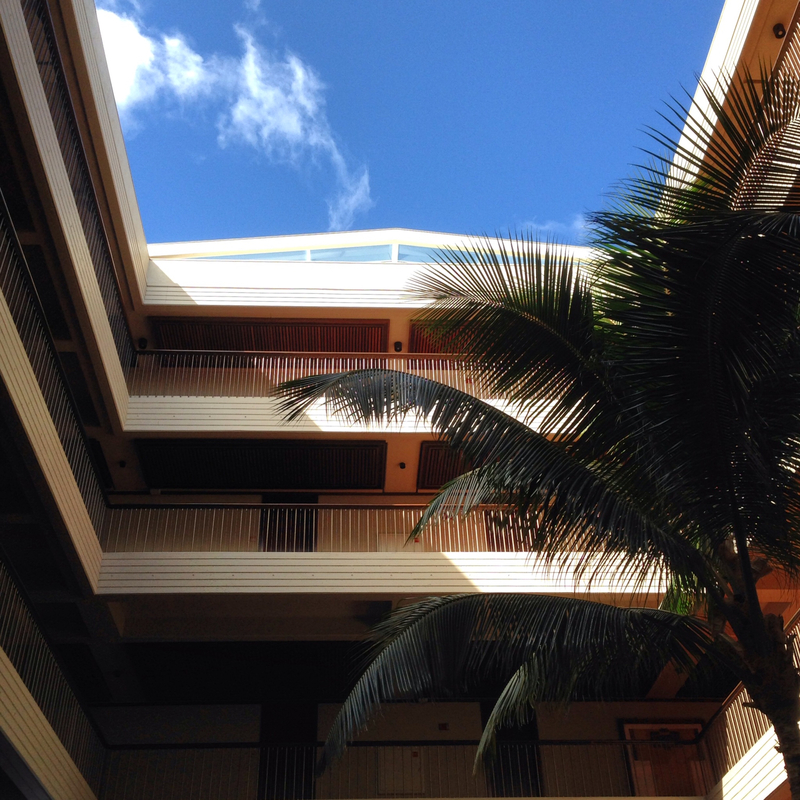 There is no outside or inside in the common hotel areas, simply roofs without walls or walls without roofs. Every space is expansive–with incredibly high ceilings, concrete as far as the eye can see. 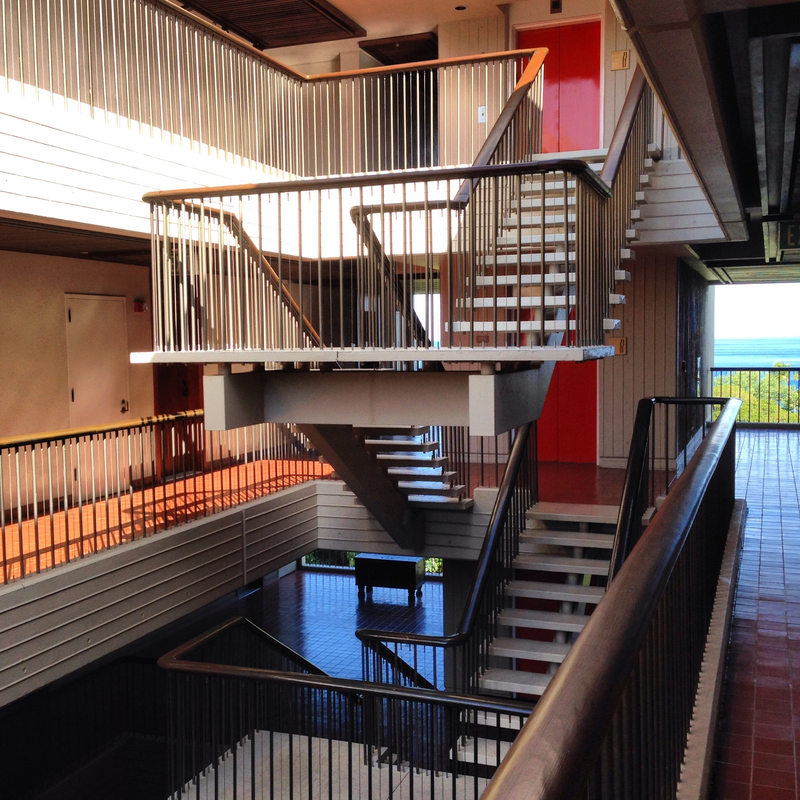 And the use of color is delightful–the bright tiles (which are blue on some floors and red on others), the amazing Hawaiian art is what punctuates a mostly sparse space. In fact, the whole structure is rather modest for a resort. Rooms aren’t spread out across various buildings, you won’t find the various restaurants or bars in different zip codes. There is one main building an an addition of new rooms (built in the 1980s). You could easily walk from one end of the hotel to the other in ten minutes. Kona is an expansive island which actually makes exploring it difficult. It can easily take four hours to drive from one end to the other. But I embraced this mentality and did my best to discover the immediate surrounding areas. It was to my benefit, in fact, as I got to check out (and compare) other hotels in the area. When I was told some of the best food on the Island could be found at the Four Seasons resort, about a 15 minute drive away, I knew I had to visit . In contrast with the Mauna Kea, The Four Seasons is enormous. No, it is gigantic. You enter one building to register and then your room could be so far away, you’ll need a golf cart to get there. When we arrived for dinner, we got lost walking to the restaurant twice! It was a ten minute walk through poorly lit alleys. Despite its airs, the whole resort is rather vernacular. It seems disassociated from its surroundings, resembling any other resort you might find somewhere else tropical. It screams Pirates of the Caribbean but without any of the fun. Not a single material there is native to Kona. It is (despite a lengthy Wikipedia article that disagrees) a sort of copy and paste job. And you can see it because the architects chose to build something that “represented” Hawaii than something that belonged in Hawaii. It is worth noting two things about The Four Seasons. Firstly, we had slow-cooked boar there and it was delicious and second is that, and I do feel this is important, very few people who were born or raised in Hawaii worked at the resort. Very unlike the Mauna Kea, where you found lifelong Hawaiians not only in staff, but as customers at the spa and salon too! 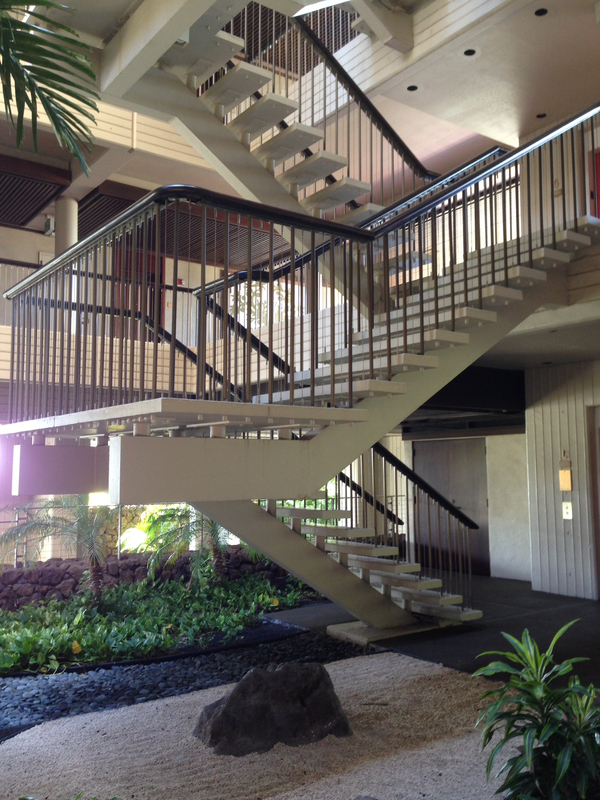 Of course, the beautiful beachfront access doesn’t hurt my adoration for the Mauna Kea but in all, it is a spectacular modern hotel for one reason alone: respect. The SOM team not only worked on respecting the space, but the environment itself. You get a sense that the hotel is nestled into the Island, having found an appropriate (and small!) space for itself. Its modesty suits its modernity. Instead of making a guest forget they are in Hawaii, they feel more a part of the Island. 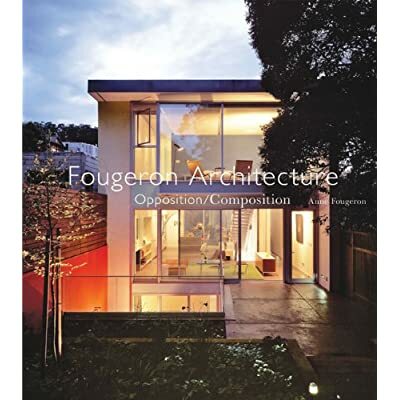 ← Fougeron Architecture on the cover of Architectural Record! Wonderful Blog on two hotels. I was at SOM NY when they had just finished the Mauna Kea.